According to Gen. x. 22, 24; xi. 10-13; and I Chron. i. 17, 18, the third son of Shem. Bochart's identification ("Phaleg," ii. 4) of this name with the Arrapachitis of the Greeks, an Armenian region, north of Assyria, adjacent to the Great or Upper Zab river, has long prevailed. The Arrapachitis, however, did not belong to the Semitic world; and it would be difficult to account for the element "-shad" (very improbably explained as an Armenian element, "-shat," by Lagarde, "Sym." i. 54). Still more improbable is the Kurdish Albag. Delitzsch's ("Paradies," 256) explanation from the Assyrian "arba-kishshati" (the four quarters of the world), has not been confirmed. More recently, the view of Michaelis, anticipated by Josephus ("Ant." i. 6, § 4), that Arpakshad contains the name of the Kasdim or Chaldeans, has become predominant. 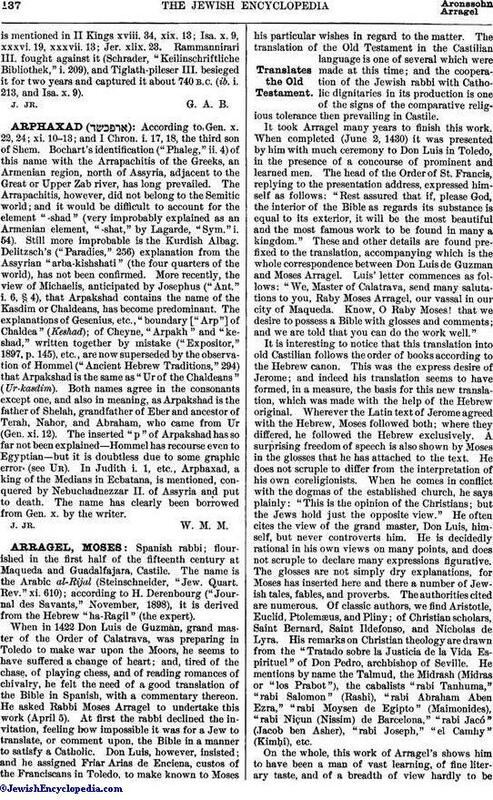 The explanations of Gesenius, etc., "boundary ["Arp"] of Chaldea" (Keshad); of Cheyne, "Arpakh" and "keshad," written together by mistake ("Expositor," 1897, p. 145), etc., are now superseded by the observation of Hommel ("Ancient Hebrew Traditions," 294) that Arpakshad is the same as "Ur of the Chaldeans" (Ur-kasdim). Both names agree in the consonants except one, and also in meaning, as Arpakshad is the father of Shelah, grandfather of Eber and ancestor of Terah, Nahor, and Abraham, who came from Ur (Gen. xi. 12). The inserted "p" of Arpakshad has so far not been explained—Hommel has recourse even to Egyptian—but it is doubtless due to some graphic error. (see Ur.). In Judith i. 1, etc., Arphaxad, a king of the Medians in Ecbatana, is mentioned, conquered by Nebuchadnezzar II. of Assyria and put to death. The name has clearly been borrowed from Gen. x. by the writer.